Canadian CF-18 Hornet Demo INBOUND! Buckle up Sacramento and help us welcome back some serious “TURN & BURN”! Our Canadian friends fly a very distinct demonstration with a one-of-a-kind paint job. Having seen this demo evolve over the last 15 years, I can tell you with confidence that you’re in for a full-tilt treat – just check out that paint job! This year’s design commemorates 60 years of the North American Aerospace Defense Command. The design includes elements from NORAD’s logo – lightning bolts, a north-pointing sword, the globe, and silver stylized wings that evoke both the northern lights and radar sweeps. The motif is undeniably symbolic of NORAD’s ongoing commitment to the protection and defense of North American airspace, and the RCAF’s (Royal Canadian Air Force) role in guaranteeing Canadian sovereignty. 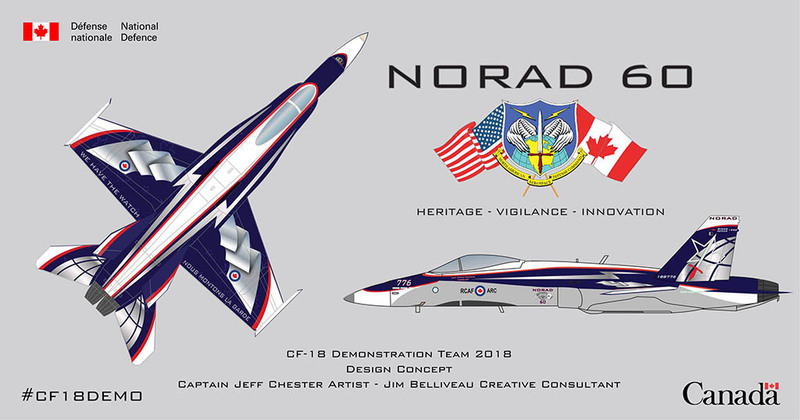 The CF-18 Demo team is looking forward to showcasing 60 years of Canada and the United States sharing “the watch” through NORAD. Pilot, Captain Stefan Porteous, will wow audiences in this of-a-kind CF-18 throughout North America during the 2018 air show season. A versatile, world-class fighter aircraft, the supersonic CF-188 Hornet, or CF-18 as it is popularly known, can engage both ground and aerial targets. Its twin engines generate enough thrust to lift 24 full-size pick-up trucks off the ground! As the RCAF’s frontline multi-role fighter, the modernized CF-18 is used for air defense, air superiority, tactical support, training, aerobatic demonstration, and aerospace testing and evaluation. RCAF personnel and aircraft have more than proven that they can fight alongside our Allies — they are battle hardened, and the capabilities of the CF-18s today certainly enable them to effectively serve alongside fighter aircraft being flown by its NATO Allies. More fun is on the way!